Hey! Do those butts look familiar? Mike and I are the poster children for the race! Ultima Frontera is organized by Michelle Culter and Eric Maroldo. Michelle is a screen writer living here in Spain. Eric is a musician who has a band here with some Spanish musicians. They live near us so we are looking forward to getting to know them better. The race course is from the imagination of our friend, Paul Bateson. The race flyer was created by Paul and is a picture of Mike and me from 2 years ago. 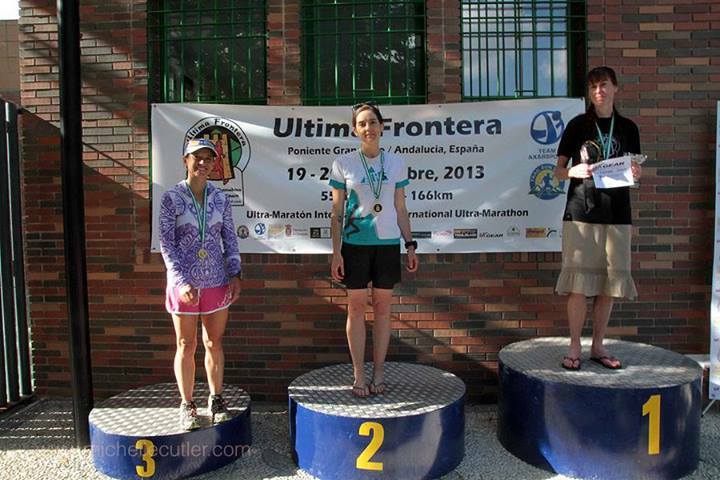 Ultima Frontera was my first ultra in Spain. How could I not run the race if I was on the poster!? It is always funny showing up for a race where 55k is the shortest distance. I felt a bit lame but I am certainly in no shape to run 50 or 100 miles! 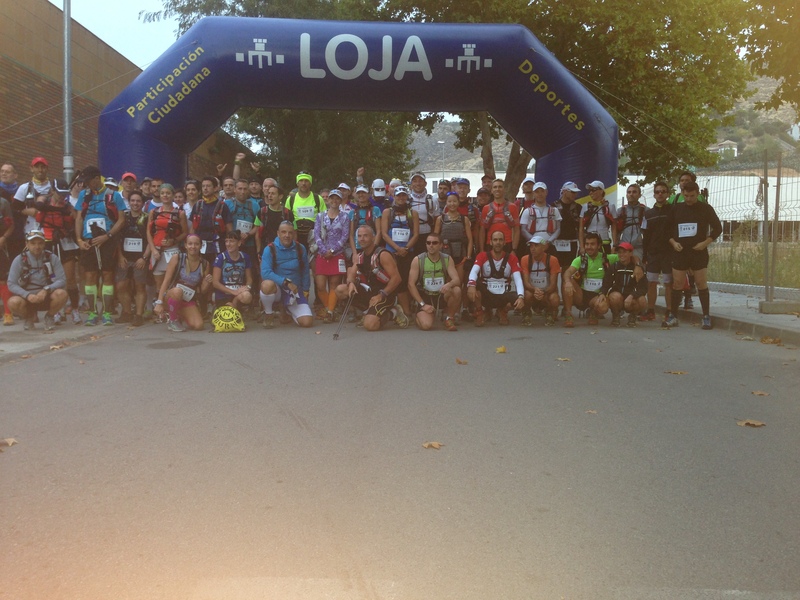 The race started in Loja, 32 km from our little village of Alhama de Granada. Mike and the girls were recruited to run the first aid station/check point so we got up early together. I put on the clothes that I had laid out: my bright orange compression socks, a pink running skirt, a black t-shirt, my favorite cap and my Nathan hydration pack. 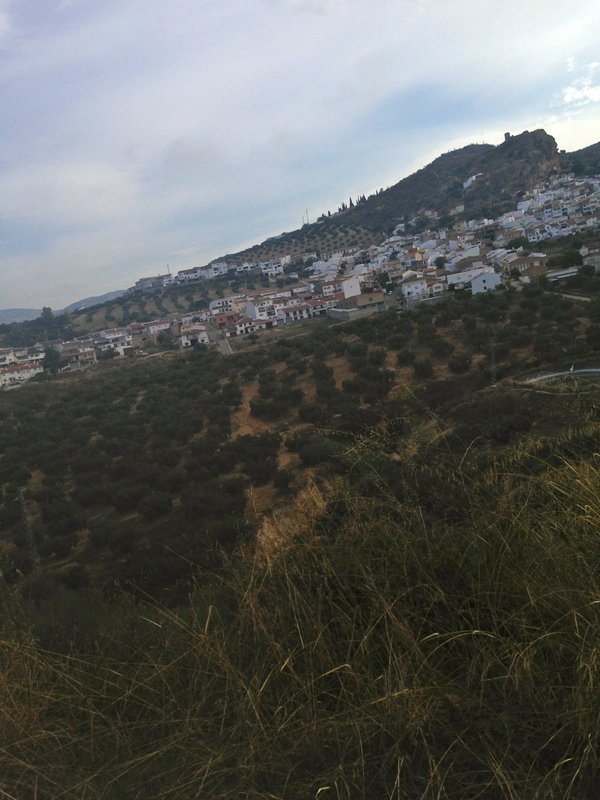 We drove to Loja under a full moon that peeked in and out of the clouds above the olive groves. The morning was cool and a bit foggy. We arrived with plenty of time to pick up my race packet but I still had that nervous pre-race anxiety that is always there. I made the usual 2-3 trips to the bathroom, worried that I’d be too cold in my outfit and ate 1/2 a peanut butter and jelly sandwich. The prerace information warned that there would not be much aid on the course so I filled my hydration pack with 1.5 liters of water, 6 gels, toilet paper (you never know!) and my phone. 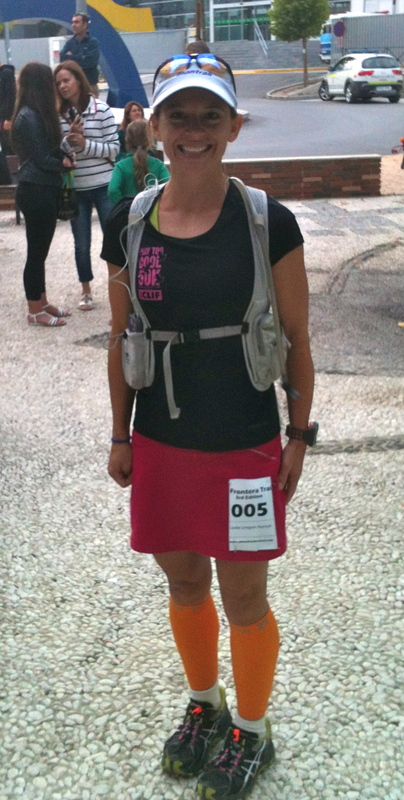 I pinned my “dorsal” (race number) to my skirt and I was ready to go. Just a little pre-race jitters! The starting group was small enough to pose for a group photo. Although there were only 99 runners registered for the 3 distances, 22 countries were represented! We started running from La Medina Cauxa Municipal Stadium under a blow up arch that read LOJA across the top. I placed myself near the front knowing that most of the runners would be doing twice my distance and would probably be starting slowly. 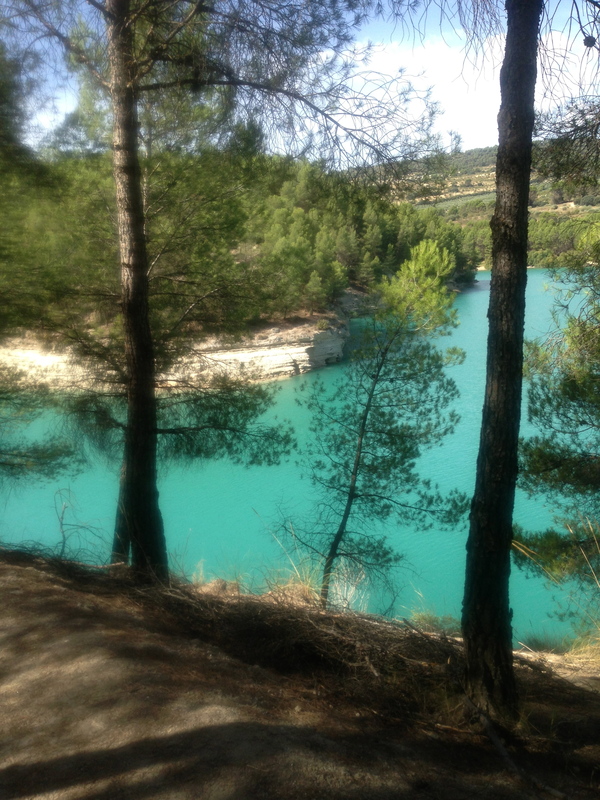 We ran out a paved road but within 1/4 mile we were happily climbing a dirt path following the Rio Genil. I ran along saying Hello or Hola to anyone I passed. I eventually fell instep with a woman and her partner from Malta. I was listening so carefully to her that we missed one of the first turn offs! Luckily some of the people behind us shouted and whistled at us until we realized our mistake. We doubled back and got on the right trail. We only went 1-2 minutes out of the way but it always feels bad to run a single extra step in such a long race. 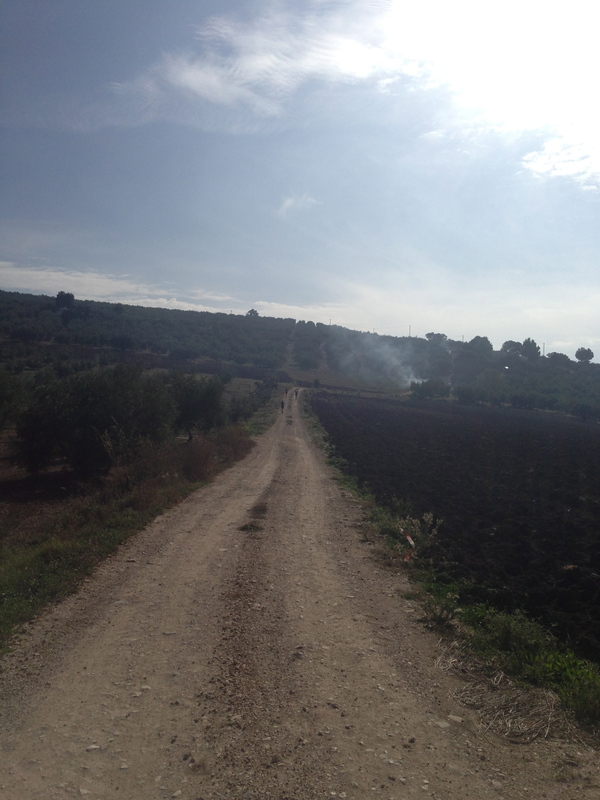 We wound around the hillsides with beautiful views of rolling hills and olive groves. It was a cloudy morning and by the time we reached the top of the first climb we could see clouds hovering over the countryside level to where we were running. At mile nine we came to a crazy house straight out of Alice in Wonderland! 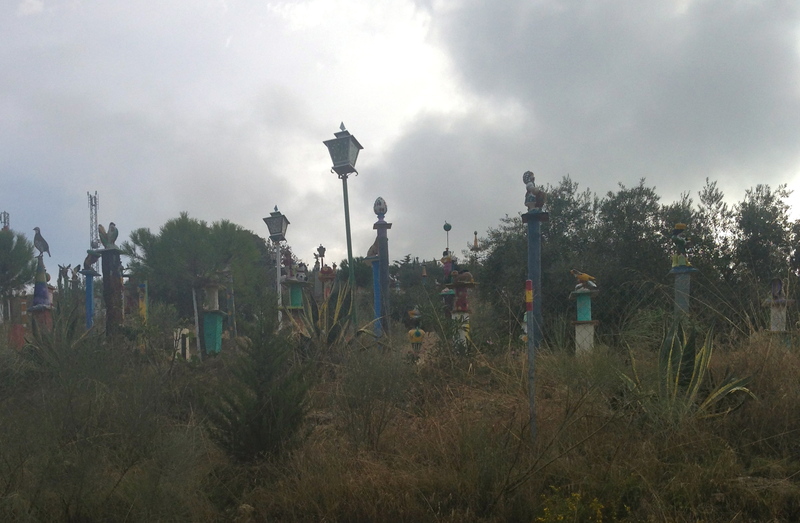 The driveway was lined with poles each with a little decoration on top. There were colorful teapots, snails, girls with baskets, birds, bunnies and more. I slowed to snap a photo. I’d love to return to get a better look! I wondered if the course went past their drive intentionally for the entertainment of the runners. 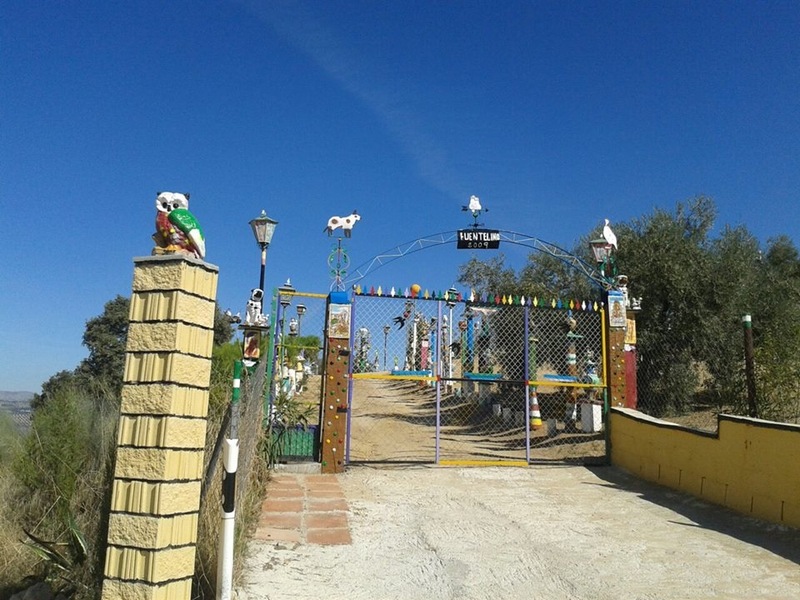 From the Alice in Wonderland House we descended into a little town called Zagra at 17 km. Zagra. Photo is a bit crooked because I was trying not to stop running! We ran past curious Zagrans peering off balconies and standing in doorways. Most people just stared, some shouted “animo”. We were through the town in minutes and headed up an impressive road climb to the town of Ventoros de San Jose. I was excited to arrive in Ventoros because I knew my family would be there. Mike, Sky and Savannah were manning the 20km check point. I spotted Sky first in her CATS t-shirt, jumping up and down as she ran out to greet me. Mike filled my water pack, Savannah gave me a banana and another volunteer was recording our numbers. My beautiful family hugged me, wished me luck and sent me off down the road. Finally some downhill! I ran and visited with my new friend from Malta, Karen, until the road started to climb again. Karen reminds me of my friend Megan who runs the ups the same pace as the downs. I watched her disappear up the hill but reeled her in on the downhill which is my specialty. At one point on a particularly long downhill I ran along alone. I followed the red and white ribbons and the green arrow off the road onto a dirt path. I passed a familiar “Coto de Cazo” sign. I see these signs all the time on my runs. They mean that the area is a hunting preserve but I had yet to see any hunters until that day. I heard shots and some men talking loudly. One hunter disappeared up a row of olive trees. The other, shot gun slung over his shoulder and dog at his side ambled up the trail ahead of me. I was grateful for my road cone orange compression socks and my bright clothes. I was pretty sure that I wouldn’t be mistaken for an animal of some kind but I definitely quickened my stride until I was well out of range. I know it is probably silly to worry about men with guns in olive fields but it made me nervous just the same. I entertained myself with making a plan for what I would do if I was shot at, if I was shot or if I came across a bleeding runner. By the time I stopped worrying about the guys with the guns several kilometers had passed. 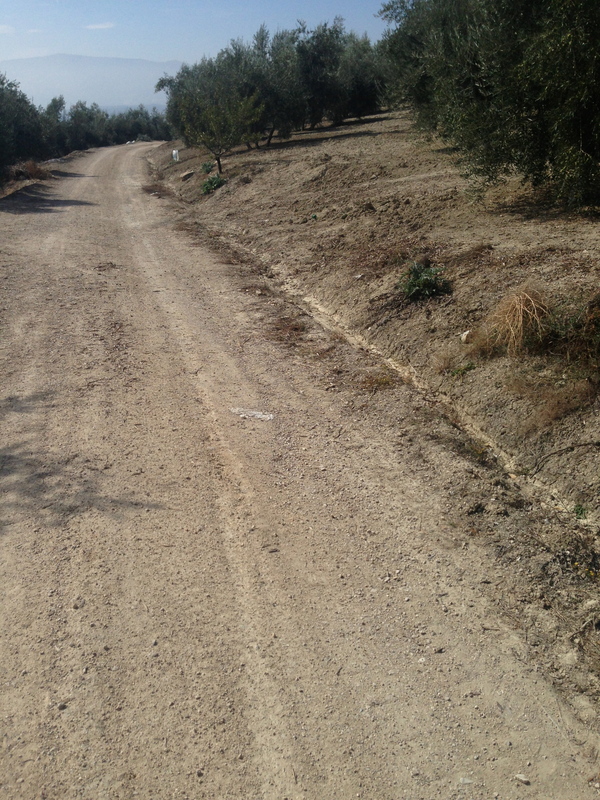 The course continued between the olive groves and down deserted country roads lined with fig and pomegranate trees. Karen and her partner eventually caught me and I had company until we reached the 35 km check point where they would journey on to the Montefrio climb to continue the 83 km race and I would turn back towards Loja. I was alone for the rest of the race. There were no other competitors that I could ever spot either in front or behind me. At this point I was really careful to watch for ribbons and arrows for fear of making a wrong turn and being completely alone in the middle of nowhere. I ran into Huetor-Tajar and the last check point at 42 km. I still had plenty of water so I just stopped to say hello to Barbara, Michelle the race director’s mother. She wished me luck and recorded my number. I ran off eating a banana feeling really good considering I had already run a marathon. I only had 13 km (about 7 miles) to go but anyone who has run more than 20 miles knows that no matter how good you may feel with 6- 7 miles to go, it is possible to completely blow up in the last couple of miles. I knew I had one last climb before the end. I actually welcomed the hill when I started to ascend, knowing that once over it I could just coast the downhill to the finish. I made it to the top of the last climb at about 50 km (31 miles) and was excited to start down. I sped up and about 20 steps into the downhill both of my quads cramped! I jolted to a stop. I tried to stretch but that just made my left hamstring cramp. I imagine that I looked pretty silly jumping around all alone on the road. I plopped down on a rock to try to relax my legs and think about what to do. I realized that I was due for a gel a few miles back but I was out of gels. I had no salt with me, a bad mistake. I looked down at my shirt and body. I was covered with salt. I started licking my arms and sucking on my shirt. That probably looked stranger than the cramping dance but I was desperate! I pushed myself to my feet and delicately tried to run. Amazingly my quadriceps cooperated and didn’t cramp again. I’m not sure if it was the arm licking or the rest that helped but I was able to finish the race without having to stop again. 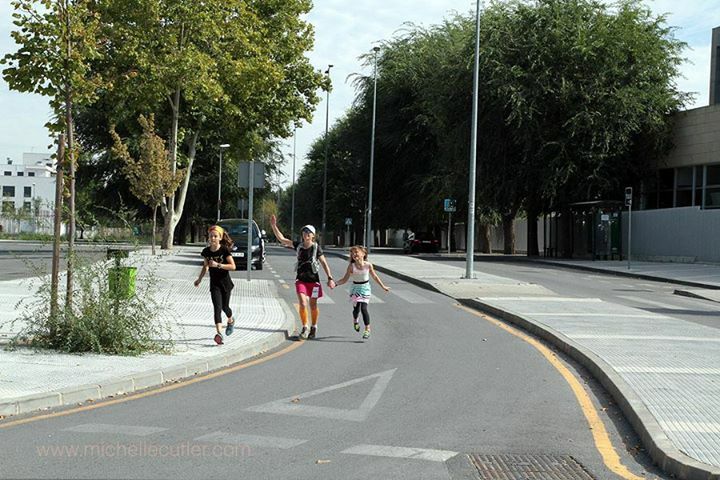 Sky and Savannah ran out to meet me at the finish and I happily ran under the LOJA arch and accepted my finisher metal! Made the Podium, 3rd place! After the race we hung out at the finish. There was a restaurant next door so we joined the other finishers and ate pizza and hamburgers. We drove home to Alhama and we all collapsed on the couch to watch a movie. It was a great day for me. Even with the cramping break I was really happy with my time. Thanks so much to Mike, Sky and Savannah for their support! For more information about the race or to sign up for next year go to http://www.ultimafronteratrail.com Click on the little British flag in the right-hand corner to see the page in English.